BATF: You’re already well-known in the fashion and beauty circles, but for those readers who may not be familiar with your work, could you give a quick run down of how you got to where you are, doing makeup on celebs like Lady Gaga to becoming the Director of Artistry Relations and Education for The Makeup Show? James Vincent: It’s a combination of setting goals, having the drive to meet my goals, having the personality and ability to follow up, and the makeup technique to back it up. Having the ability to put yourself out there and network has gotten very easy because of social media, but if you don’t have the technique to back it up then there’s not a credibility that comes along with. I feel like I’ve been very lucky — I’ve met people who have been mentors to me and that’s one of the reasons education and mentoring is such a big part of what I do. Giving back is so essential. BATF: What are your tips for mastering the application of fake lashes? JV: One of the best tips I learned from [fellow makeup artist] Billy B is, instead of applying the glue to false lash, apply it using an eye liner brush right along lash line, like you would a liquid eyeliner. Then, just press the band right in the glue and that gives it enough time to get tacky and it will fall in a more natural way. If someone isn’t savvy at applying false lashes, try cutting the lash into two or three sections and then applying only the section that you need keeps it easier. Removing the longest section will make it easier and makes the lash look more natural because it tends to be the outer part of the lash that looks very false. 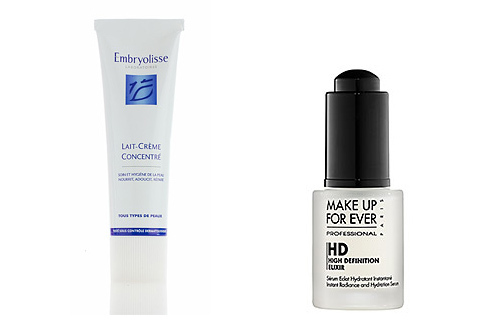 BATF: Do you have a current favorite under-eye concealer? JV: There are a few concealers I like, but I’m not really a concealer person. For me, I don’t like the difference you see on skin when you’re using concealer. It absorbs and reflects light differently than foundation on the skin. That’s why in photographs sometimes, the areas where you use concealer look very obvious. Instead, I like to color correct: I use foundation and concealer that uses color theory to get rid of discoloration and dark circles or blemishes, and some of my favorite products for that is Make Up For Ever’s HD color correctors. I do also like their HD Concealer because it has a lot of movement to it, so it’s great for under eyes since you don’t have to worry about creasing. Eve Pearl’s concealer is one of my favorites. I think the colors are perfect and it looks like skin. Yves Saint Laurent Touche Éclat is something I probably use in every application. Traditionally, what I do is whatever foundation I’m using, I try to use that as my concealer with a bit of color-correcting because I’ll get a much more even look to the skin. BATF: When you say color correcting do you mean those greens and purples you layer your foundation over? JV: Any color really. If you take two complimentary colors and layer them on top of each other, they neutralize each other and cancel each other out. Instead of using a traditional concealer — a very opaque, dense product that you use to kind of build up and literally camouflage discoloration — with color theory, you can use a very sheer, thin veil of color so you’re not building up so much product on the skin. And yes, that’s when you use greens to cancel out reds, or peaches oranges to cancel blues. You’ll use a lot less makeup that way, and the results to me always feel a lot more natural. BATF: I’ve read you describe yourself as the no-makeup makeup artist – what’s your secret for creating a flawless look? JV: One of the big things is just making sure you have skin properly prepped. If you don’t have good skincare and you don’t maintain the skin, you cannot keep makeup so sheer. For me, it’s going in with something that helps create a beautiful balance to the skin, making the skin looking as good as possible before you even put makeup on. 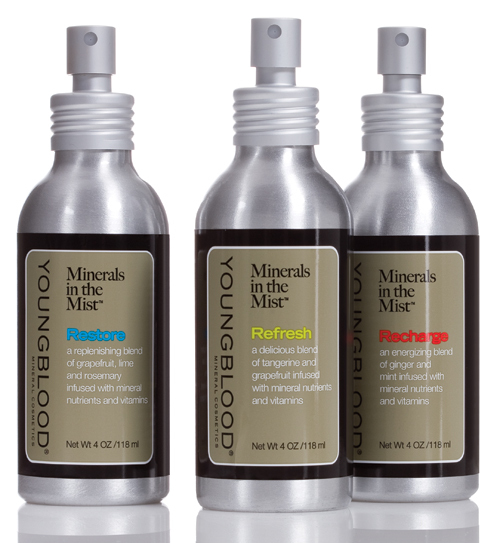 I love Youngblood’s Minerals in the Mist. It’s a great for keeping skin fresh and lively. I also love Embryolisse Lait-Crème, it’s just one of those products that every makeup artist has in their kit and a great way to get rid of dehydration and tired looking skin. The other thing I tend to use a lot is the Make Up For Ever HD Elixir. It is a really beautiful primer for the skin for any skin type under any foundation, it just makes pores look minimal and gives every skin an really even canvas to work on without adding an extra layer or anything heavy. BATF: My background is Indian, and I feel like a lot of South Asians have a really hard time finding foundation that matches our color – do you have any tips or maybe products that you like for medium to darker skin tones? JV: One of the reasons that I find makeup so difficult for women of color is that traditionally, makeup minds haven’t thought of them. My background is women’s studies and I got into makeup because I was writing a thesis on women of color and the white beauty myth. It was while I was in London that it all fell into place because so many of my clients were Indian or Pakistani and had skin tones that were not available in foundation shades. That’s when I really started working with color theory because what I find with a lot of my clients from that area of the world (or for a lot of Dominican women or Southern Italian women), the under-eye discoloration is really the only area on the face where they might need coverage. As soon as I color correct out that discoloration, I don’t have to go in and do much of other makeup. I think it’s a really amazing time in makeup because for the first time we are seeing cosmetics brands recognizing the needs of these women. We say in the United States there are 27 shades of African American skin alone, and when you go to the makeup counter, there are only three bottles that maybe fit their needs. Forget about Latina, Asian, and East Indian and any of these other areas. For most women, if they get rid of discoloration it will be much easier for them to match foundation. And also there is never one shade for anyone. Women have been tricked into thinking that they need one foundation for their skin, but the skin is made up of more than one tone. Especially for my Indian clients, what I like to do is tell them take two colors — a lighter color and a darker color — and bring it together and only use it on the areas of the face where you have discoloration. You don’t need to bring foundation over your whole face. BATF: What are some products at The Makeup Show this year that you’re you most excited about? JV: One that I’m so excited about right now is Make Up For Ever’s Aqua Liner. It is the most beautiful liquid liner. It’s completely waterproof. I was the first one to use it at Miami Fashion Week for swim. I literally put the models in the pool and the makeup does not move. It’s amazing for those women who always have problem with makeup transferring on their eyelids, or not showing up for their skin tone. The other thing I’m really looking forward to is the Obsessive Compulsive Cosmetics‘ Tinted Moisturizer that will be launching at the show. OCC has really used The Makeup Show as a springboard for launching new products. Their launch of Lip Tar at our LA show was probably one of the biggest things to hit makeup. Every makeup artist wants it in their kit now, it’s something everybody talks about. It really has become that product that everybody needs. I’m excited to see what they’re doing with skin. I think an addition of a tinted moisturizer to their brand will be really beautiful. We’re also seeing a number of brands put out new tools. We have a new brush line from Crown that is an affordable line of luxury brushes that allows every artist to really have set that feels super quality at an affordable price. Kevyn Aucoin is launching for the at the NY show for the first time and they have so much in the range that people will be excited about. Yves Saint Laurent Beauty is premiering their new eye shadows that are highly pigmented. YSL has never offered a makeup artist discount, so it’s kind of a brilliant way to get them into the shore. The other big buzz is Glamcor, who has a lighting system that will be at the show. BATF: Last question! Food is a big part of my blog, so I have to ask you: What’s your favorite restaurant in NYC? JV: That’s a tough one! You know, I’ve been in New York for about 15 years, and my boyfriend is a bit of a foodie so we do tend to go to a number of different restaurants. But for me, as a New Yorker, I’m very neighborhood-oriented so I like to keep it in my hood. My favorite restaurant in New York (which there’s one in Brooklyn and there’s one in Nolita), is Café Habana. It’s a Cuban restaurant that was started by a brother and sister who grew up in the neighborhood, and they continue to give back and develop programs for kids in the area. With the Brooklyn location, they’ve created a green environment where all of the water that they use is collected and filtered, their blenders are made with bicycle power, they use solar energy and it’s really become a place for the community to gather. That’s what I really love — seeing New Yorkers, natives and the people living here now, and tourists coming together and celebrating that meal. 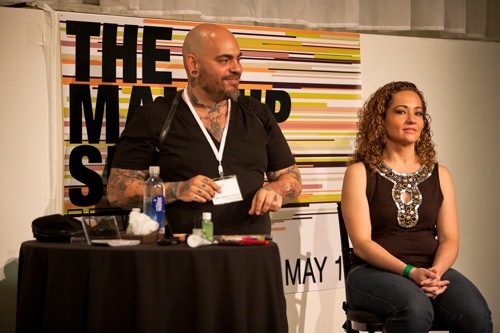 All Vincent’s favorite products will be available at a discounted price at The Makeup Show in New York, which takes place on May 15-16 at the Metropolitan Pavilion. Visit their website, www.themakeupshow.com, for more info! Who found his tips helpful? Leave a comment and let him know! great interview with awesome advice i’m def going to get some of those products! I came across an article, with your address, reguarding:Laura Geller inkwell waterproof gel liner. Selling price $18.00.This comes from Ladies Home Journal, Oct. 2012. I could not find it at this site. Any help you could give me, very much appreciated.